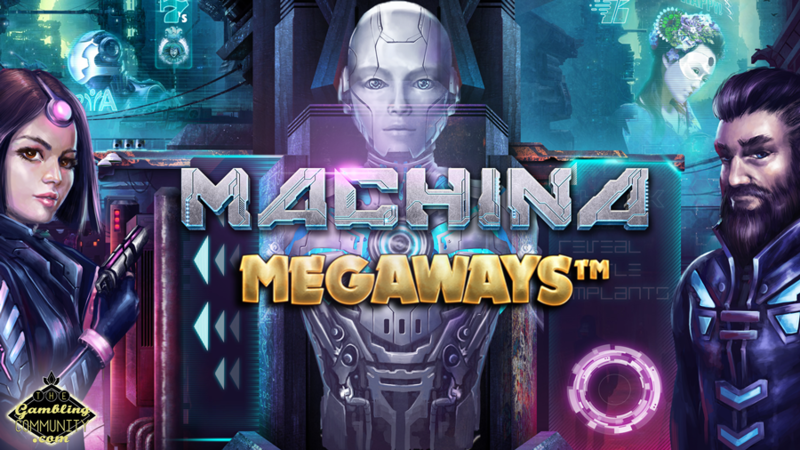 Machina Megaways is a brand new release from Kalamba Games who have jumped on the Megaways bandwagon and licensed it from BTG, it looks to utilise the bonus buy feature, the Megaway engine and have a progressive set of jackpots that are based on the stake and won in a unique fashion rather than randomly awarded! Im very excited to try it out so lets jump straight in and see if its a win or a fail! Machina Megaways has a 6 reel setup and utilises the Megaways engine where each reel can have as many as 6 symbols, giving you the potential of a maximum amount of 46’656 ways similar to Primal Megaways. 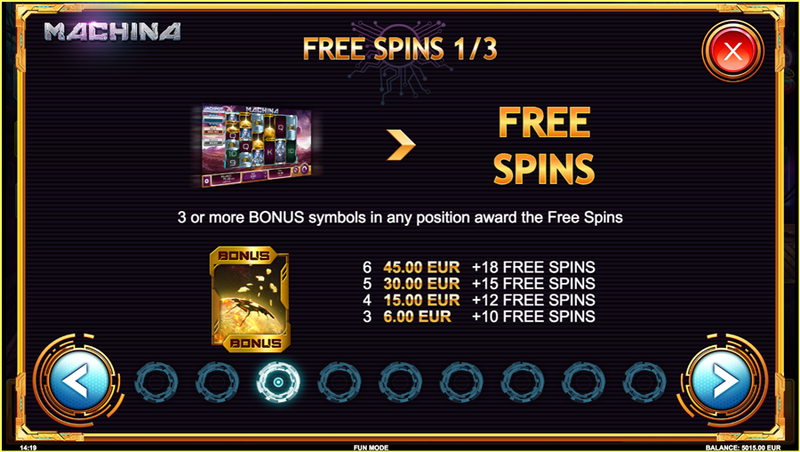 The slot has one main feature which is the free spins round, this can either be won by landing 3 or more scatters or it can be purchased with the feature buy, the example below was based on a 3 euro spin. So as you can see it has the most expensive feature buy of any game to date with 18 free spins costing 337x your total stake which is absolutely insane in my opinion, it could be argued that the games with cheaper bonus buys have the pie gambles which can add up if you lose a few in a row, but 337x to buy a feature, let that sink in! You can also buy the 10 spins for 52x, 12 for 89x or 15 for 185x your stake. 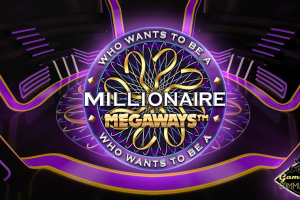 The feature can also be won by landing 3 or more scatters, 3 gets you 10 spins, 4 gets you 12, 5 gets you 15 and 6 gives you the super pricey to buy 18 spin max feature. 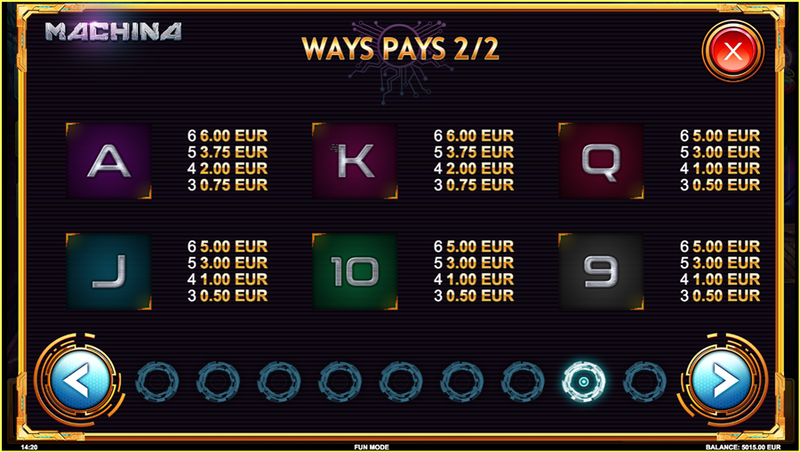 Once the feature starts your aim is to collect the bonus accumulation symbols shown below. Each time you collect one it will fly off the reels and fill a meter, the first level is filled with 4 symbols and turns the pink premium symbol into a cyborg, 4 more and the blue symbol does too, 5 more and the turquoise symbol changes and another 5 turn all symbols into cyborg’s. 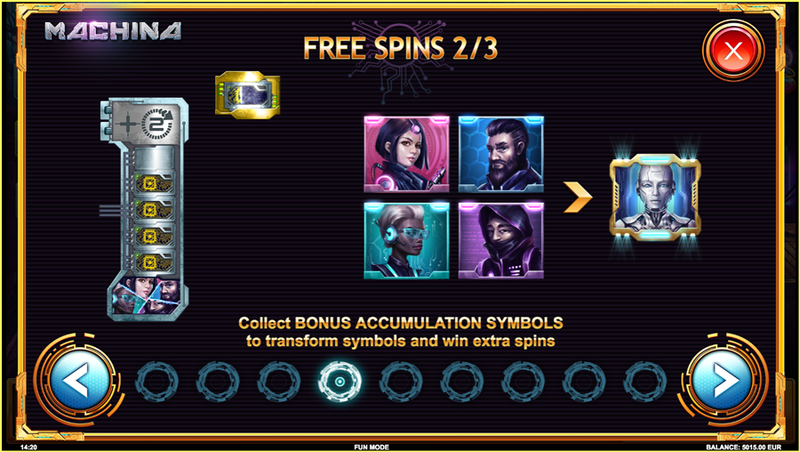 You also get 2 extra free spins with each symbol upgrade. 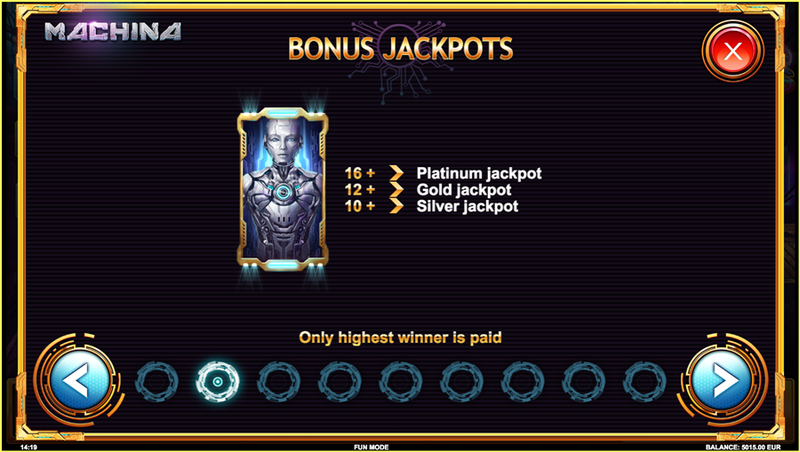 Once you’re at this stage you are hoping for as many cyborg’s as possible to land each spin as this is what awards the 3 jackpots as shown below, for 10 shown on the reels you win the silver jackpot which starts at 20x, the gold pot starts at 50x and is awarded for 12 or more anywhere on the reels, the platinum starts at 1000x your stake and you need 16 cyborg’s in view anywhere on the reel’s to win it. With every spin you make in the base game 3% of it is used towards the jackpots and you can watch them grow slowly with every spin, this is a nice touch as it could take you quite some time to actually win one of them so it helps that they gradually increase in value. 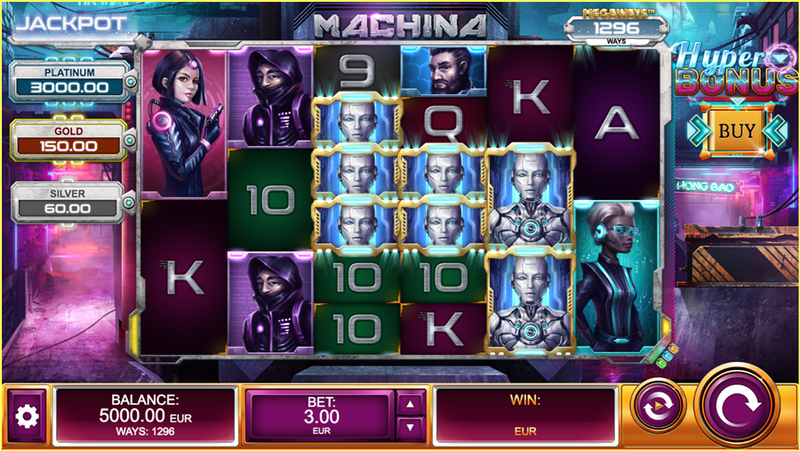 The paytable in Machina Megaways is dynamic and adjusts with your stake, the example below is based on a 3 euro spin. Starting with the lowest paying symbols we have the 9’s, 10’s, J’s and Q’s paying a measly 1.66x for a 6 of a kind, the K’s and A’s pay slightly more at 2x for a full way. Moving onto the premium symbols we have the 4 main characters all paying the same at 2.91x your total stake and the top cyborg symbol paying 3.33x for a full way. Now this might seem incredibly poor but when you take into account that the cyborg pays as a symbol as well as a jackpot and can be cloned from all symbols you realise the potential. 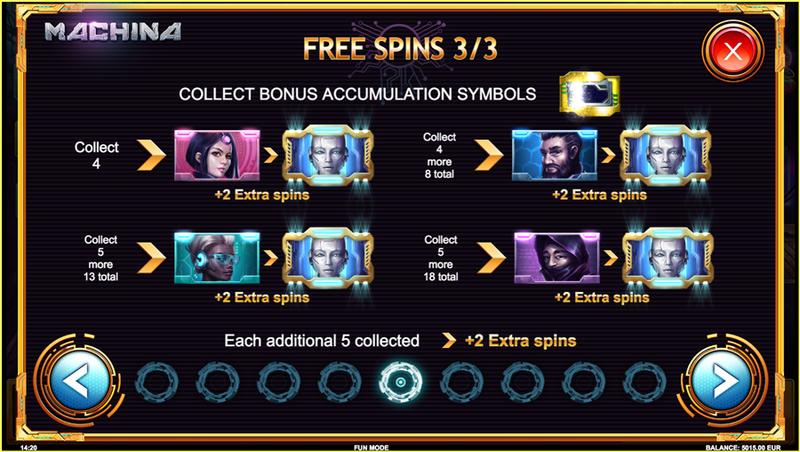 2 cyborg’s on each reel is going to be 32 ways at 3.33x plus the silver jackpot so that’s 120x your stake and with all symbols transformed you will struggle to not hit that every spin! 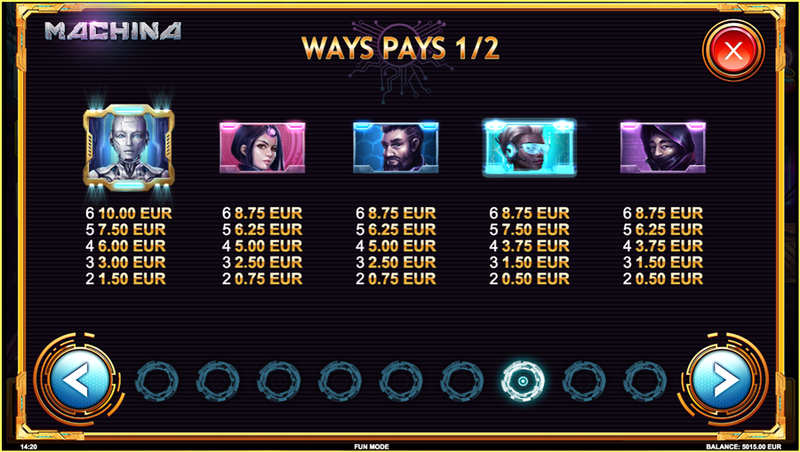 Add another 2 cyborg’s anywhere on the reels and your looking at 72 ways and the gold jackpot so you can see how the end of the bonus round really has loads of potential. 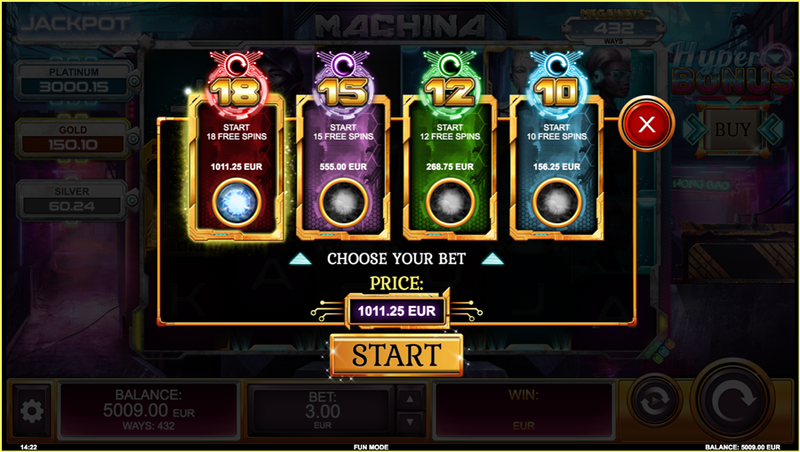 The RTP for Machina Megaways is between 96.59% to 97.42% depending how you play the game as shown below, it’s interesting that the most expensive feature has the best RTP but it makes perfect sense that it would do. 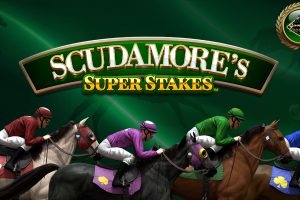 Overall the slot has a premium feel to it and the graphics and sounds are like they’ve come out of a computer game, but I just didn’t feel excited when playing it, in fact I was getting a bit bored playing the 18 spin features which considering they cost 337x your stake makes no sense. I will certainly play it in the future and I’m sure we’ll see it on many a stream once it’s rolled out everywhere but for now I will wait for others to let me know if it’s any good! 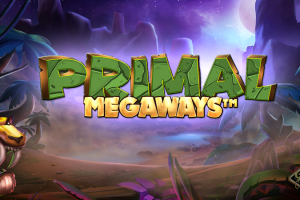 Thanks for reading and if you fancy giving this unique new slot a go theres a link below to a TGC trusted casino, good luck and I wish you many cyborgs!